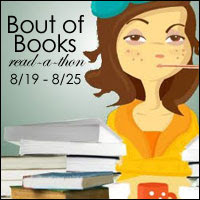 This will be the fifth time I've participated in Bout of Books. The last time (Bout of Books 6.0 in January of this year), I ran out of steam posting and quit after Thursday. I didn't stop reading—I simply stopped posting about it. So, my primary goal this time is to stick it out for the entire week and to post regularly here at LiveJournal. One thing I really like about Bout of Books is the community of readers who participate. There are some who blog all during the week and others who post tweets. I've pretty much stopped using Twitter, but I may think about re-activating my use of it during the week—particularly since my tweets are echoed over to Facebook. Read as much as possible, documenting the number of pages (or page equivalents) that I read each day. I'm near the beginning of several books, so this is an excellent position to be in at the beginning of the read-a-thon. Yesterday, I stopped by the library and picked up a copy of Black Magic Sanction by Kim Harrison. I'll be reading it at the end of the week since I don't want to carry it with me on my business trip and take the risk of losing it. During my travels, I'll be reading A Killer Read by Erika Chase, a paperback that I will be sending to fellow BookCrosser and BookObsessor BooksnBeer. This is my “printed on paper” book that I can read during take offs and landings. Other books I'm taking with me are electronic books. Two that I've started reading are Fuzzy Nation by John Scalzi and Flesh of the God by Lauren Haney. (Yes, that's right—I have already started three of these books. I routinely read more than one book at the same time.) On Tuesday when I post the Monday results, I'll include my starting position in each book as well as the number of pages read in each one.